As more schools try to revise US history, it has been found that Guyer High School in Denton, Texas is using an AP History book that completely changes the 2nd amendment in an attempt to try to “simplify” what it says. : But with more educators trying to brainwash kids into thinking that gun owners are “evil” and guns are the real problem in the world, it’s clear that these changes to the 2nd amendment is not a mistake. 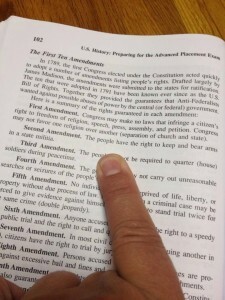 Did you catch how the textbook subtly changed the amendment? The text book is implying that we are only allowed to own guns if we are enrolled in a state militia, which is a clear misrepresentation of the constitution since the 2nd Amendment says that a militia is necessary to protect a free State. So in order to be able to have a militia, the citizens have a natural right to keep and bear arms and the government cannot infringe on that right. The name of this text book is “United States History: Preparing for the Advanced Placement Examination.” And the page in the picture is page 102. We encourage all parents to check their students history books for purposeful inaccuracies like this.